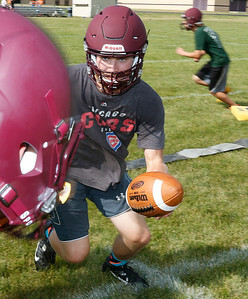 H. Rick Bamman - hbamman@shawmedia.com Richmond-Burton running back Dylan Cline runs a route during football camp on Wednesday, July 13, 2016. 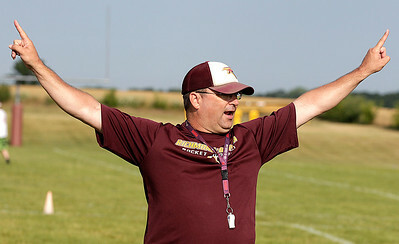 H. Rick Bamman - hbamman@shawmedia.com Richmond-Burton head coach Pat Elder directs his players during football camp on Wednesday, July 13, 2016. 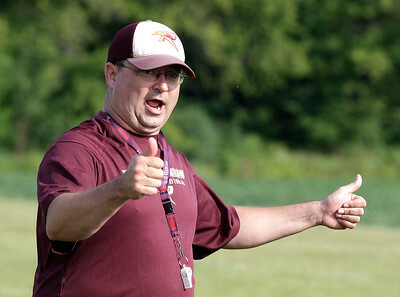 H. Rick Bamman - hbamman@shawmedia.com Richmond-Burton head coach Pat Elder encourages his players during football camp on Wednesday, July 13, 2016. H. Rick Bamman - hbamman@shawmedia.com Richmond-Burton quarterback Brady Gibson hands off during football camp on Wednesday, July 13, 2016. 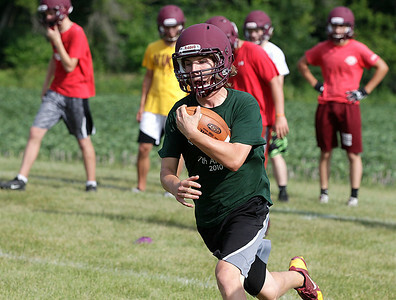 H. Rick Bamman - hbamman@shawmedia.com Richmond-Burton quarterback Brady Gibson runs a bootleg during football camp on Wednesday, July 13, 2016. H. Rick Bamman - hbamman@shawmedia.com Richmond-Burton players on the line during football camp on Wednesday, July 13, 2016. 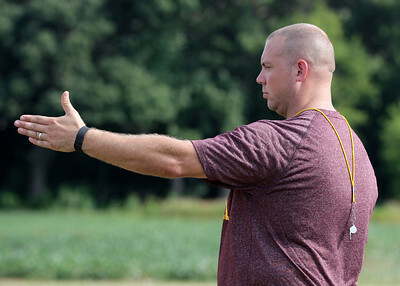 H. Rick Bamman - hbamman@shawmedia.com Richmond-Burton's oftensive line coach Tad Porter instructs players during football camp on Wednesday, July 13, 2016. H. Rick Bamman - hbamman@shawmedia.com Richmond-Burton quarterback Luke Uhwat runs a bootleg during football camp on Wednesday, July 13, 2016. 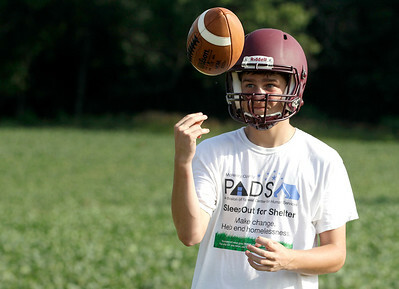 H. Rick Bamman - hbamman@shawmedia.com Richmond-Burton quarterback Luke Uhwat during football camp on Wednesday, July 13, 2016. 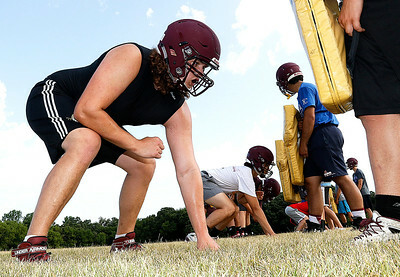 H. Rick Bamman - hbamman@shawmedia.com Richmond-Burton's 6-10 lineman Dalton Wagner sets on the line during football camp on Wednesday, July 13, 2016. 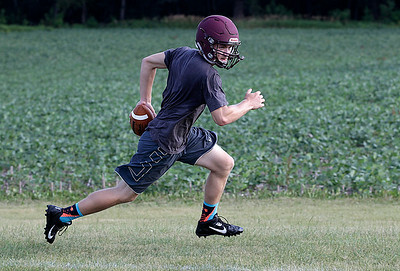 H. Rick Bamman - hbamman@shawmedia.com Richmond-Burton quarterback Ben Wasilewski runs a bootleg during football camp on Wednesday, July 13, 2016. 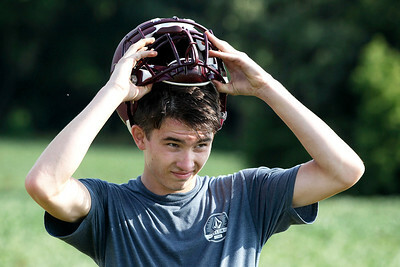 H. Rick Bamman - hbamman@shawmedia.com Richmond-Burton quarterback Ben Wasilewski during football camp on Wednesday, July 13, 2016. 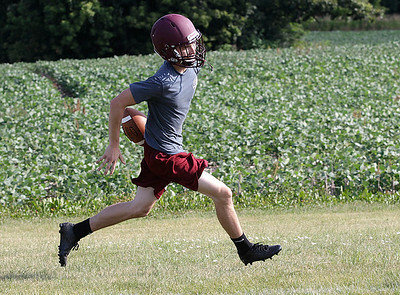 Richmond-Burton running back Dylan Cline runs a route during football camp on Wednesday, July 13, 2016.